Is anyone else out there upset with the recent format changes in Blogger? At my age I'm doing well to keep up with technology. Once I get comfortable with something, I don't adapt well to change. I liked when I used to go to Blogger Dashboard that my reading list appeared. Now I have to go in search for it. It took me about 10 minutes Thursday morning to figure out how to start a new post! Why are some of my older posts showing up as drafts, yet there are comments so I know they were posted? And why is it trying to publish before I'm through composing??? Can someone steer me through the changes? Or can someone recommend an alternate platform? On this Thanksgiving morning, while I am thankful for so many things, I want to especially highlight the blessing of getting to "know" so many "virtual friends" through blogging. Every day I look forward to reading about your adventures, learning from your misadventures, receiving your comments, and benefitting from your advice. Thank you, Dear Readers, for your friendship! Alex and I made it to Conway Tuesday with only minor glitches -- a tire pressure light that eventually went off after the temperature warmed up (apparently my tires don't like 37 degrees), and a wiper blade that almost flew off in a rainstorm. Thanks, Toyota Conway, for your quick and kind service! ... and the games commenced. First up was Phase 10 Twist (a twist on Phase 10). I started out strong, had a brief sprint to the front midway, but in the end Son-1 took the prize (bragging rights only). After dinner we played Colt Express, a game of schemin', stealin', and shootin' in the Wild West. So politically incorrect in so many ways, it was still fun and challenging. Alex and I teamed up as Cheyenne. Our best schemes were thwarted in rapid succession and we finished in last place. The turkey went in the brine last night and is soon headed for the oven along with sides of glazed carrots, green beans almandine, and colcannon mashup. Son-2 is the head chef in this family but DIL is in charge of the turkey. The meal is always beautiful and delicious! Looking forward to more fun and games while watching the Macy's parade this morning and sports this afternoon. All-in-all, the Best kind of Thanksgiving celebration. Best wishes to everyone for a blessed Thanksgiving. I just don't know when to stop! Lately I have been striving -- not always successfully -- to "use it up." If I've used a fabric in a project, I'm trying not to put leftovers or scraps back on the shelf. ... and the leftover border from quilt 2 went into quilt 3. No doubt there will be a Teal Quilt 4 using the border I'm considering for this one! This is what is on my design wall this Monday. Still working on the layout. I had to cut creatively to get 6 repeats. It will be a small quilt, or the center of something larger. We'll see where this leads! Linking with Judy at Patchwork Times. Did I Say Open Week? I decided a friend needed a hug on Monday so went out to lunch with her. Tuesday it was dinner out. Wednesday it was grocery day, out. Thursday, went out to pick up DH at car place and on to Sears to pick up a dishwasher part. Friday, back out to pick up car. Saturday, modern guild meeting. I always find it hard to get back in the sewing groove after going out; so much for an "open" week! But let's see how much progress I made. I finished cutting the 320 geese -- actually, about twice that many since I altered my color plan. That is to say, I developed a color plan -- black/hot pink/yellow/gray -- based on this inspiration fabric. Oh, well, I'm happy with the little geese and they will make a great leader/ender project. Sew don't be looking for a finished quilt any time soon. Next I corrected the wonky intersection in teal quilt 3 and stitched the long seam, only to discover that I need to construct a whole 'nother row of blocks to balance the bottom side of the quilt!! Not enough fabric to make it all the way around. And looking at this photo I think some blocks may be turned wrong!!! Sorry to say this one has gone back into the box until I feel up to dealing with the disappointment. Having cleared off that spot on my sewing table, I came across another new modern quilt pattern and started thinking about what fabric I might have on hand that would work for it. You know what's coming next, don't you. Yep, I started cutting another project-- Obligated. I'm using a collection of wild and crazy prints designed by Sherrill Kahn for Robert Kaufman. The background in the pic is one that was used in the pattern example so that was my inspiration point. But I think it's a bit muddy with the feature prints I'm using so I may go for a solid background .... hmm, maybe a black. What do you think? Beside the Obligated pattern on my sewing table was a stack of pieces I think I made for Bonnie Hunter's mystery, Grand Illusion, 2 years ago. These funky 2" checkerboards didn't seem to go with everything else in that quilt that was on a 2.5" grid -- at least in my mind, anyway -- but they were made and it was time to do something with them. Borders will probably have to wait till after Thanksgiving, but this is what I have selected. I purchased this fabric in Hawaii about 8-10 years ago and have been looking for the perfect project. There will be a small black inner border to set it off. Underneath that pile of checkerboards was a stack of HSTs that were cut off heart blocks the modern guild made for Pulse survivors and families. They were all trimmed to an even 4.5" so it didn't take long to whip them into a top. I passed this on to another guild member on Saturday to add borders from her stash. Then someone else will add the back and another will quilt it -- kinda round robin approach to a charity quilt. Holiday Frost is still in three pieces, but it should be a quick Sunday sew in between loads of laundry. So I accomplished quite a bit, even though I didn't do what I had planned. I'll be showing off my scrappiness at Quilting is More Fun than Housework on Sunday. I'm happy to report that DH came through both cataract surgeries without incident, though he does have a condition in the retina of one eye that may require further surgery. The good news (for me, anyway) is that he has been released to drive and has mastered the art of administering his own eye drops that will have to continue for quite a while to help the retina situation. I still do a double-take when I see him without glasses. And I'm afraid he'll poke an eye out trying to push the phantom glasses back up his nose!! Finally a week with no appointments or other obligations! I'd be a slug if I didn't make good use of the time available to me (in between eye drops). 1. Stitch the last two long seams on the red/gray Christmas quilt. After a good pressing, measure and cut borders which will probably be applied at Smores' Christmas retreat. 2. Stitch the last seam on teal quilt 3. This requires a slight adjustment between two blocks in order to make the seams line up. Considering the loose approach I had to this quilt, it's surprising I only have one intersection to correct. Teal Quilt 3 - see the lump? 3. Finish cutting 320 2x3" flying geese -- yes, I'm cutting a new quilt. I bought a modern pattern at a recent quilt show and couldn't wait to get started on it. 4. Quilt the Christmas table runners. That's my plan and we'll see if I stick to it. One of the best ways to bust a sewing funk is to find some mindless sewing. And it has a double benefit if it also gets some s(crap) off your horizontal surfaces! The plan is to have 25 columns of 15 rectangles (50" x 60"). So far I have 19 columns of 12. I will intentionally stagger the columns so that I don't have to match seams! And I am considering inserting some neutral squares here and there for interest. Since I don't have room on my wall for 25 columns, I'll take the finished strips to the next retreat where I'll have more space to come up with an "artful" arrangement. Generally, I'm not big on making totally scrappy quilts -- mainly because I think they need to be TOTALLY scrappy to be effective and my organized brain resists doing that. But I'm proud to say that I have pretty much just grabbed two rectangles and sewed on this one. About the only organization I've attempted is to alternate light/dark and to avoid having the same fabric in any column. And guess what -- I like it! Linking up with soscrappy for Scrap Happy Saturday. Linking with Quilting is More Fun Than Housework for Oh Scrap! Or maybe a sewing table? I've been in a bit of a funk lately, not inspired to sew much. When I get that way I try to make myself DO something, anything to make myself feel productive. And that often results in a cleaning and/or organizing. I have a really nice desk on the bridge upstairs, but I found that I was always wanting to check something on the laptop while in the kitchen on the main floor or downstairs in the studio. A couple years ago, when I needed the computer to write and modify pattern instructions as I made a sample quilt, I set up this table in the sewing room. And that's where the laptop resided until the unfortunate scamming incident this summer -- I was too upset to even write about it at the time but it has definitely contributed to my funk. The laptop went to the fixit shop and the desk began accumulating a variety of detritus. It was about time to make room for the laptop again, but that involved filing about 3 month's worth of receipts, and trashing expired coupons, and tossing dried up pens, and finding a home for last year's files, and well, you get the idea. Now that it's cleared off, however, I'm thinking it might make a nice sewing table. See those little silver dots on the leg? The table height is adjustable so it would be easy to lower it to a comfortable position and it would be the perfect place to put my Pfaff with the dual feed to do the quilting on these Christmas table runners. I think I may have just talked myself into it! Can I call it a goal if I am not specific? First up, though, thanks to Heidi at Red Letter Quilts for hosting One Monthly Goal (OMG) for the majority of the year. She has handed the baton to Patty at Elm Street Quilts. so be sure to hop over there and see the specific goals others have set for the month of November. But back to my non-specific goal for November. My plan is to make yet-to-be-determined quilted gifts for the four caregivers who have been so faithful in their care of my mother-in-law (a/k/a The Queen Mother). While they get a nice Christmas bonus from Alex and his mom, I always try to make something to show my special appreciation for being free to pursue my quilting passion. I gave them all quilts several years ago, thinking that would be MIL's last Christmas. Yet, the Eveready Bunny is still with us. I'm thinking it will probably be a table runner of some sort this time. In fact, I made these last year, but didn't have time to finish them. It would be easy to get them sandwiched and quilted. I have a couple other table runners started, so maybe I'll finish them. With a week of the month already gone, I'd best get crackin'. 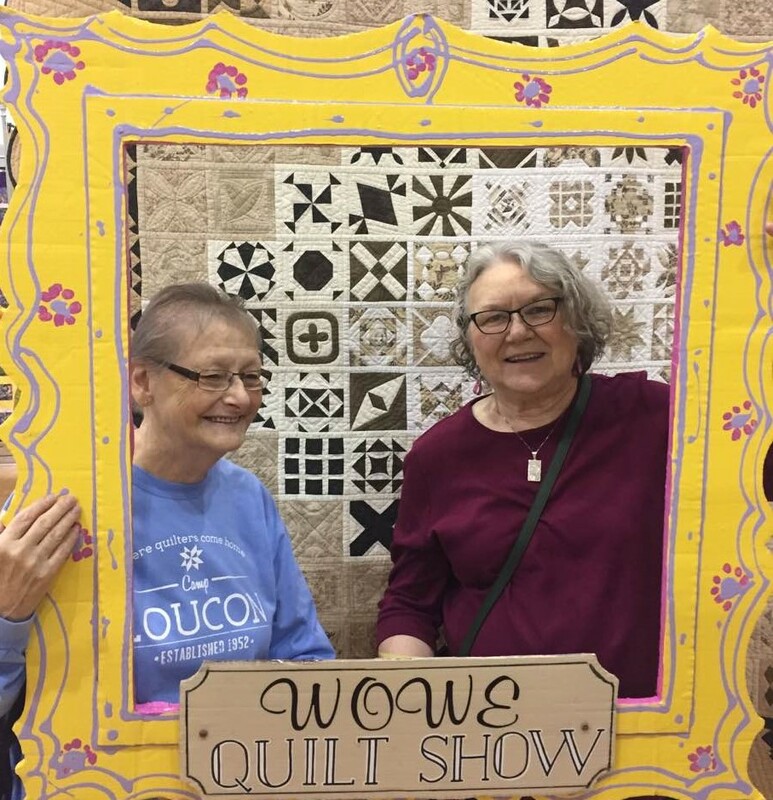 Today my friend Nancy and I ventured about 50 miles west to a local quilt show put on by an organization that helps local women. Supported by several quilt guilds, the show has gotten better every year. Did I remember to take my camera? No, so you'll just have to take my word for it. The White Oak Women's Exchange (WOWE) does a number of things right at the quilt show and I think they are worth mentioning. 1. Admission is free -- which gives them an opportunity to share their mission with the community who might not pay to come. However, there is a donation jar and I'll bet they get more that way than if they charged each person a set amount. 2. Displayed in the entrance foyer are the simple comfort quilts they make for the women they help. They have compiled a pattern book of these quilts which is now available on CD. 3. There is an extensive boutique of quilted items, as well as surprise scrap boxes. 4. A non-juried show, the quilts are categorized into three groups based on size and a fourth category for miscellaneous quilted items like table runners, bags, and clothing. Viewer's Choice is the only prize awarded in each category. 5. In the display of quilts they group guild projects (e.g., classes) together. It is so interesting to see the different interpretations of the same project in different colorways and fabric styles. 6. But the best idea this year -- I have no idea if it's original or "adopted" -- was the photo op picture frame. Since neither Nancy nor I entered a quilt in the show, we opted to have our picture taken in front of this fabulous Dear Jane done in brown, taupes and tans. (That quilt was my Viewer's Choice in the bed quilt category.) The frame is made from corrugated cardboard so it's light and portable. Everyone was having so much fun having their picture taken at the show and I'll bet quite a few show up on Facebook in the next few days. I LOVE locally organized quilt shows. I was inspired and I had a fun day with a good friend. Can't beat that for a Fall Friday!! Linking with Confessions of a Fabric Addict.